Schemes turning theory into practice applied a carbon price to the equivalent of about 7 billion metric tons (7.7 billion tons) of CO2 emissions worldwide last year, according to the World Bank(another carbon pricing booster). That represents about 12 percent of all anthropogenic greenhouse gas emissions. And the World Bank and IMF have set a goal to extend carbon pricing’s footprint to 25 percent of global emissions by 2020. 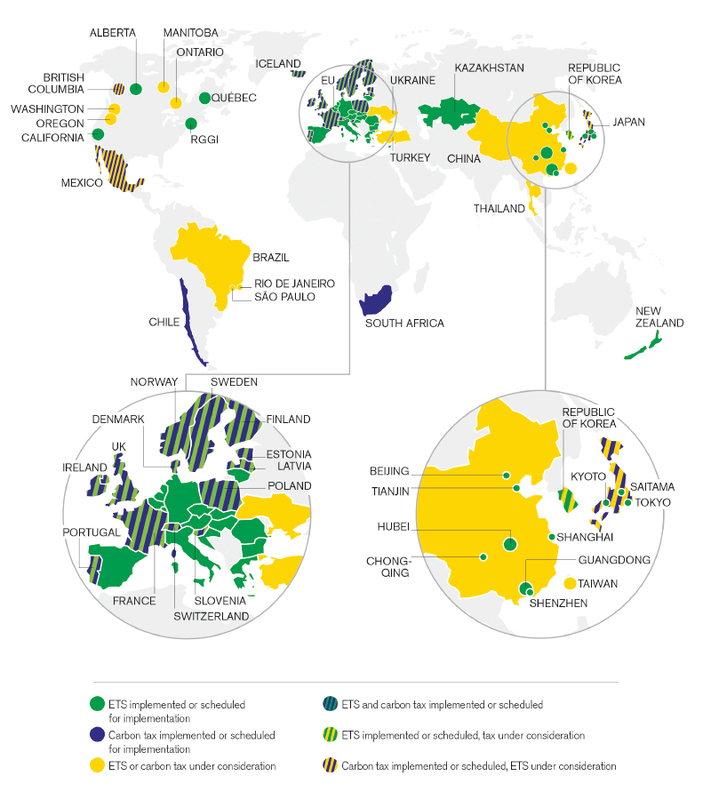 Graphic of global emissions trading systems and carbon taxes adapted from World Bank Group: State and Trends of Carbon Pricing 2015. Large circles represent subnational instruments; small circles represent cities. Click for full view. 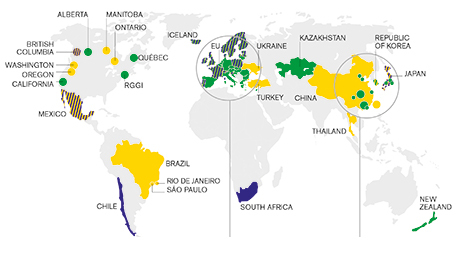 In most cases, carbon prices are set by national, regional or municipal carbon markets. Governments create these markets by putting an upper limit on total annual greenhouse gas emissions for given sectors of their economies, then issuing tradable“allowances” or “credits” for those emissions. More than a dozen carbon markets are now operating, putting a price on 8 percent of global GHG emissions. In the past five years new carbon markets have been launched in California, Quebec, South Korea, and major Chinese industrial centers such as Shanghai, Tianjin and Guangdong. 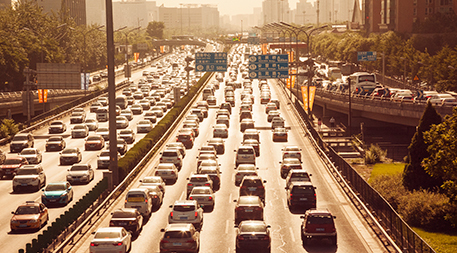 Experts say the two approaches to carbon pricing share more similarities than differences. Unfortunately, their similarities include chronically low prices — prices too low to drive substantial emissions reductions or to inspire low-carbon investments. Most carbon markets and taxes are well below US$15 per metric ton (1.1 ton), whereas members of the International Emissions Trading Association recently estimatedthat €40 (US$44) per metric ton (1.1 ton) pricing was required to achieve the goals of the Paris Agreement on Climate Change. Academic researchers concur. A 2013 research survey by the U.K.-based Grantham Research Institute on Climate Change and the Environment, for example, estimated that the ETS was having a “small but non-trivial impact” on European carbon emissions. It found no evidence that carbon pricing was driving investments in new equipment or innovation needed to meet the EU’s long-term emissions targets. Despite this strategy, the California/Québec carbon price alsocrashed after a few years. It currently sits near the latest auction floor price of US$12.73 — a price level that puts little downward pressure on emissions. Jaccard argues that policies such as California’s renewable portfolio standard, which has fueled aggressive deployment of utility-scale solar and wind farms, are driving California’s emissions reductions. “The cap is not actually forcing down emissions. Regulations are,” he says. In British Columbia, this revenue neutral formula drove a rapid reduction in CO2 emissions at little cost to the economy during its first four years, with per capita use of fossil fuel dropping up to 19 percent. Several studies suggest that British Columbia’s economy may have actually accelerated as a result thanks to the stimulative effect of cutting income and business taxes. A 2015working paper from the University of Calgary, for example, estimates that employment in the province grew 2 percent between 2007 and 2013 due to the carbon tax. 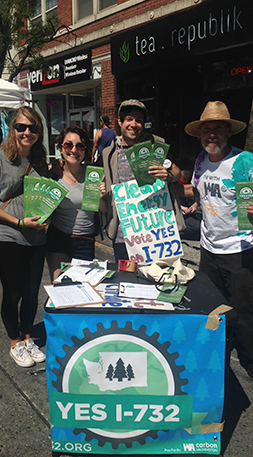 “We have a very tax-sensitive electorate in Washington,” acknowledges Joe Fitzgibbon, chair of the Washington State legislature’s environment committee. Others have expressed concerns that the initiative could leave the state with less revenue. And environmental groups are rallying instead behind cap and trade, with revenues to be redirected to environmental programs (including protect the state’s forestry jobs) rather than tax cuts. Steffen Böhm, an expert in carbon markets at the University of Exeter Business School in the U.K., has come to the same conclusion. He says that his research indicates that carbon pricing policy is consistently undermined by lobbying from commercial interests.